3. Why is demo content not being imported? 5. How to update a theme? 10. How to enable Visual Composer front page editor? 13. Widgets not properly aligned. 16. How to set the home page? 18. How to import Slider revolution? 20. “Are you sure you want to do this? Please try again” ? 25. Missing style sheet error when installing the theme? The plugins that you got after the purchase are called bundled and we, as a theme authors, have purchased an extended licence for them. That means you don't have to activate them and they'll work for you regardless of that. In the following text we'll explain how the bundled plugins work. When a plugin is updated, the theme author will include the latest version of the bundled plugin with their next theme update. So you can easily update the bundled plugin when you next update your theme. 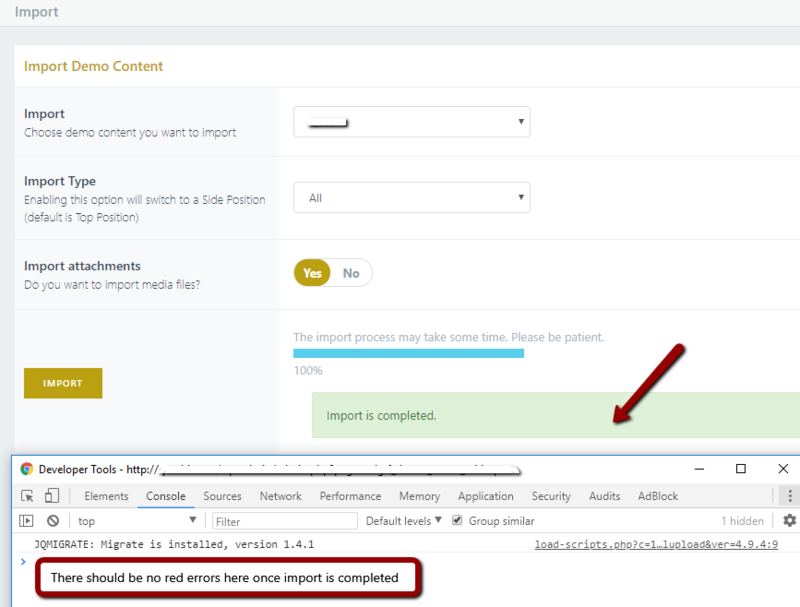 When it comes to importing demo content, before you hit import, disable all 3rd party plugins (to free up server resources), then go to import, open chrome developer tools, hit Import, and watch console for errors. When some error occur refresh import page and repeat the process. Importing demo content must reach 100% without displaying error in the console. So repeat it until console is clear (sometimes you have to repeat process for 3-4 times or maybe more). Internal Server Error 500 is usually related to server settings as the name of the error suggests. There could be several causes of this problem. First you should do is contact your hosting provider and ask them about this, and also ask them to check your error log, to see what does it say there? And try the solutions from it, increasing your memory_limit parameter first, it could be low and that could be the cause of this. And also, it is good if you can increase these values or ask your hosting service to do that for you. 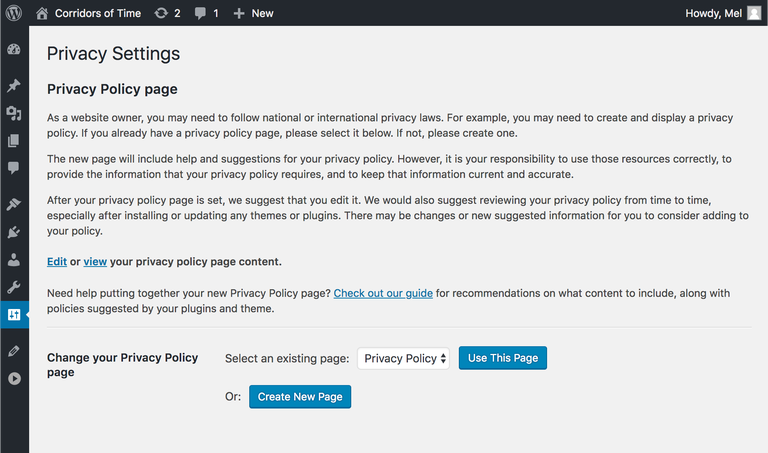 Since WordPress recently released new 5.0 version, we have tested our themes, and there shouldn’t be any compatibility issues with Wordpress 5.0. So, until we release new theme update where WP Bakery 5.6 version is included, you could reach our support team here to update this for you, or you could install Classic Editor plugin to continue working on a way you used to. If you want permanent modification for future updates you should add that line inside child theme folder / functions.php file. Since WordPress themes get more robust and complex, it's necessary that you release some more power from server. You can do that by editing php.ini file that you can find on your server, or contact your hosting service to do this for you. You should also make sure PHP version on your server is updated. 5.6 will do the job, but you may use 7 as well. We advise that you do this from Google Chrome, no matter the Operating System. Go to Edge Options > Import. On your keyboard press F12 and select "Console" view. If you wish to import all demo content (pages, posts, widgets, options) you should choose "All" for "Import type" field. 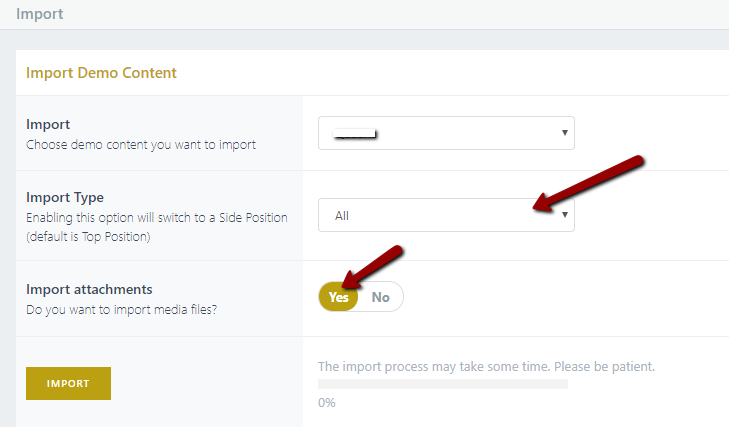 And if you wish to import media library for our theme, check "Yes" for "Import Attachments"
Then hit "Import" and follow console view. If you see any red error showing up, you should refresh the page and try again. Repeat the process until demo import is completed, following a successful "Import Completed" message, without errors in the console. If the progress bar doesn't reach 100%, you can finish the import via XML. To so so, navigate to Tools > Import > WordPress > Run Importer. Upload the theme-export.xml file, which you can find in the file you downloaded from ThemeForest, in the folder "xml export." If the connection runs out, simply upload it again and again, until you receive the message that import has completed. Next, in Theme Options > Import, run the import, but ONLY for Widgets and for Options. There is no need to run it for Content again. You should go to Dashboard > Plugins and enable all plugins. Then go to Appearance > Menus and remove duplicated menu items. When importing a demo onto your site RevSlider slideshow has to be imported separately. 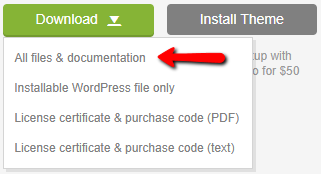 To import a RevSlider from one of our demos please go to your WordPress admin panel Slider Revolution -> Import. Search for RevSlider / desired_file.zip located in the file you downloaded from Theme Forest / xml export folder and import that demo’s slideshow. 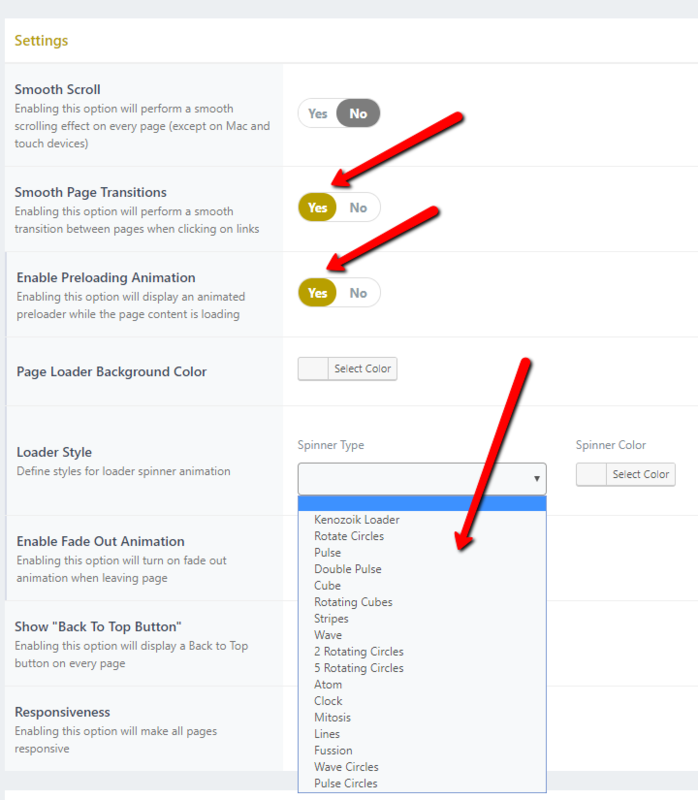 Please understand that this won't add font to the list inside Theme Options and only way to apply it is with custom css code. 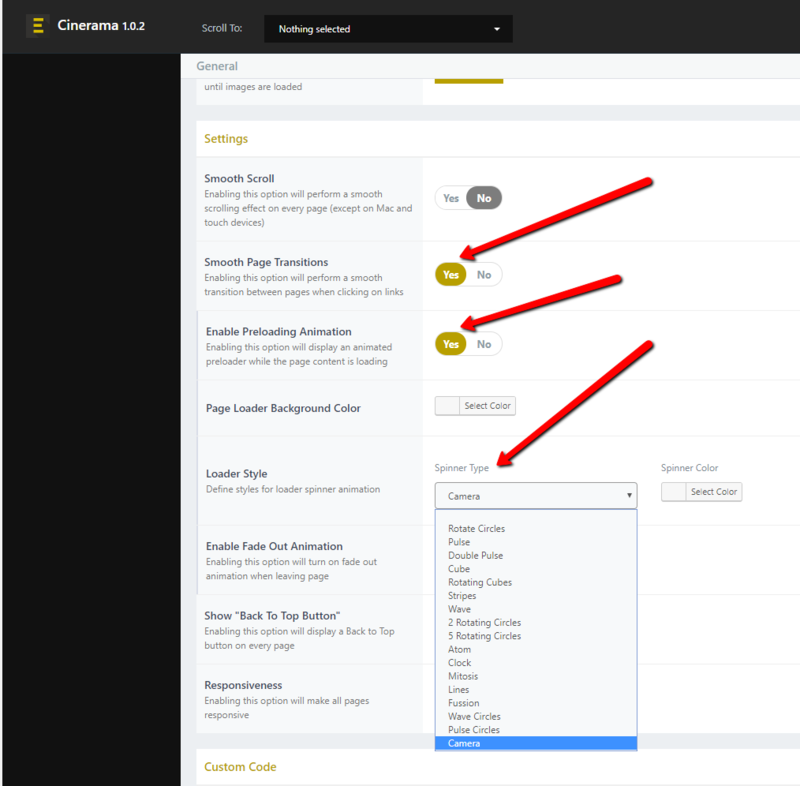 *Custom css field could be also places in Appearance > Customize > Additional Css. Given how super relevant GDPR is, we thought we’d give you a heads up on the most recent and best selling items to help remain GDPR compliant. This is the common issue when installing a theme, this error message does not mean that the theme is broken. It means that the files are not uploaded correctly, and there is an easy fix for it described in this article.